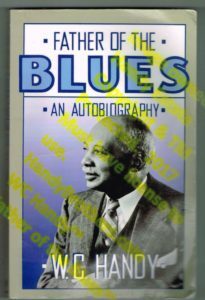 WC Handy’s Autobiography “Father of the Blues” has been selected as an inductee into the Blues Hall of Fame at the Blues Foundation’s 38th Annual Induction Ceremony. The collector’s edition of WC Handy’s “Father of the Blues” is available for pre-order in limited quantities at HandyBrothers.com. A few will also be available for purchase at the 38th Annual Induction Ceremony. This collector’s edition is complete with a commemorative WC Handy Autograph and has the original cover on the autobiography. Purchase tickets to the 38th Annual Blues Hall of Fame Induction Ceremony.